No one knows for sure who invented spectacles but he probably lived in the town of Pisa, Italy, around 1286, and was almost certainly a craftsman working in glass. But nobody knows his name. In fact we only know this much about him because Friar Giordano preached a sermon one Wednesday morning in February 1306 at a church in Florence. 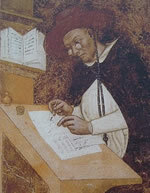 “It is not yet twenty years since there was found the art of making eye-glasses which make for good vision” said the Friar, “One of the best arts and most necessary that the world has. So short a time is it since there was invented a new art that never existed. I have seen the man who first invented and created it, and I have talked to him” We know what Friar Giordano said because admirers copied his sermons down as he gave them. The inventor of spectacles apparently kept the method of making them to himself. Perhaps he thought this was the best way of getting money from his invention. But the idea soon got around. As early as 1300, craftsmen in Venice, the centre of Europe’s glass industry, were making the new ‘disks for the eyes’. Spectacles at first were: only shaped for far-sighted people. Concave lenses, for short-sighted people, were not developed until the late fifteenth century. Spectacles allowed people to go on reading and studying long after bad eyesight would normally have forced them to give up. They were like a new pair of eyes. The inventor of such a valuable thing should be honoured, everyone thought. But for centuries no one had any idea who the inventor really was. So all kinds of candidates were put forward: Dutch, English, German, Italians from rival cities. A fake memorial was erected last century in a church in Florence to honour a man as the true inventor of spectacles – but he never even existed! Spectacles reached China in the fifteenth century. But long before this some Chinese judges had worn a kind of spectacle, made of smoky-coloured quartz. These were worn not to help the judges to see better, but to hide the expression in their eyes in court cases when evidence was being given.